The 90-year-old owner of this house on Allston and McGee in Berkeley has trimmed the bonsai trees in his garden for 50 years and they are beautiful. I enjoyed sketching from in front of his house while my sketch buddies took posts across the street and on the corner. I have a whole bunch of paintings and sketches to post so I may keep my writing brief on some of them in order to get caught up. This is one of the brief ones. The purposes of bonsai are primarily contemplation (for the viewer) and the pleasant exercise of effort and ingenuity (for the grower). Bonsai practice focuses on long-term cultivation and shaping of one or more small trees growing in a container. Bonsai does not require genetically dwarfed trees, but rather depends on growing small trees from regular stock and seeds. Bonsai uses cultivation techniques like pruning, root reduction, potting, defoliation, and grafting to produce small trees that mimic the shape and style of mature, full-size trees. So apparently I was wrong to call these trees Bonsai since they are growing in the ground and while shaped like Bonsai trees, actually are full-sized trees. So it’s not an oxymoron, but I wonder if there is a word to describe this situation: “A full-sized tree cultivated to look like a miniature tree that is cultivated to look like a full-sized tree, only in miniature.” ???? 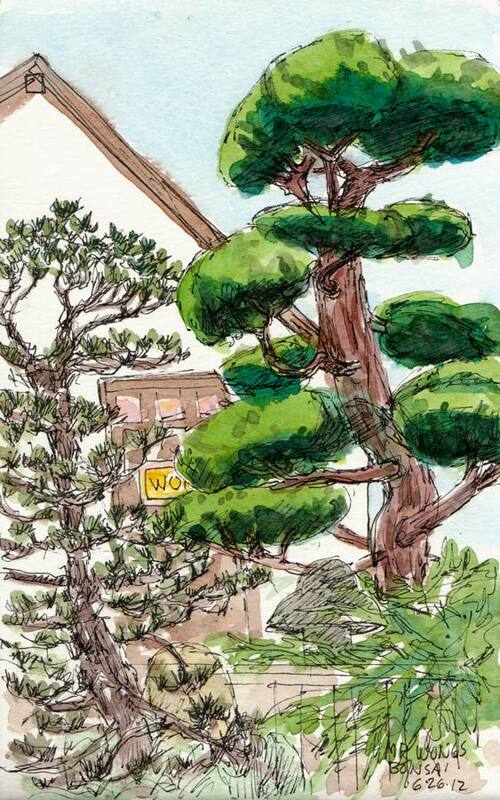 How wonderful to have a Mr. Wong who lovingly nurtures bonsai trees that you and your group of sketcher friends can draw. Love your drawing. Isn’t the phrase “giant bonsai” an oxymoron? LOL! Ah, very interesting. Thanks for the clarification. Didn’t mean to set things all a flutter. Mr.Wong must have stopped the Bonsai process some years ago to let it grow and no longer be called Bonsai since that is the process of cultivation to keep it small. Did he say?? Wouldn’t you call it topiary as they are shaped garden trees? Love your drawing whatever it’s called. i have recently moved into a home in which became an estate of a 90+ yr old couple. i have located a sketch titled …summer and dated 66. and signed either, ned or neil wong. the sketch is ethnic and depicts dark skin folks, canoes with outriggers, with folks lounging around. i opened the frame and between two pieces of cardboard is another untitled sketch signed by the same. i have no earthly concept of art, and i can find no info anywhere. i landed here and realize i have the wrong “wong” bu possibly found folks with knowledge that may help identify this, if your able to provide any info i sure would appreciate it. thanks in advance it should be noted, the paper used is VERY thin and the colors went thru to the baco of the paper, but im just guessing here..it doesnt appear to be water color, past this im lost.